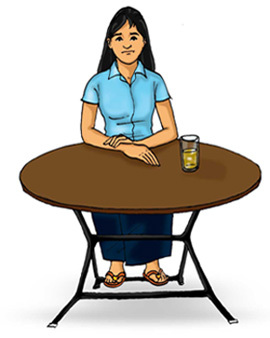 A few days after the school term finished, Bopha and Rith visited Samphos’ small home. They found Samphos busy in the kitchen, baking cookies and cakes with her mother, who sells them every day in the market. "Oh, so you came for some cookies," Samphos said with a smile. "Did you think I come to visit you?" Bopha answered. "I knew it," Samphos said playfully. "Ok, if you want to eat, you need to help us bake them!" 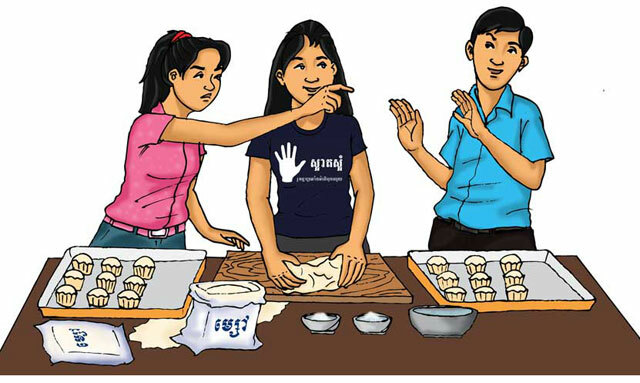 Bopha and Rith helped Samphos and her mother. They began to get hungry, looking at all the food. "OK, watch those cookies, I’m going to get more flour," said Samphos’ mother. "Hey Rith, when will you register your name for summer classes?" said Bopha. "I registered already and also for Dany," Rith said. "Ah ha, you will sit next to her," smiled Samphos. "How could you register before us? We always sit together!" said Bopha. "Samphos, we should go to register our name together," said Bopha. "So we can sit next to each other." Bopha threw some rice four at Rith. "Wait for us next time!" Rith threw some back, and Samphos couldn’t resist joining in the fun. Suddenly Samphos’ mother came back to see their faces white from flour. "How dare you!" she says. "You know what? People work hard to grow rice. I’ve done it. If you don’t respect flour, it means you don’t respect the people who work very hard in the field." "Sorry Aunt," Rith and Bopha said. "Sorry Mother," Samphos said. They continued working. Bopha continued talking about her plans. "If I have time, I want to take karate lessons! Wouldn’t that be great? Perhaps I could be a star one day. Samphos, do you want to join me?" Samphos sighed deeply. Money was a problem for her family "I don’t know. I should ask my mother first." After lunch the three students sat outside, eating cookies. "We’d better go." Rith said. "Ok, thanks for today," said Samphos. "Samphos, tomorrow, do you want to go to register for summer class with me? I can come to pick you up." Said Bopha. "Um... eh... I have to ask my mum. So can you wait for after tomorrow?" replied Samphos. "Ok, no problem," said Bopha. Bopha and Rith headed off. Samphos thought, I hope mother will be OK to pay for my summer class. 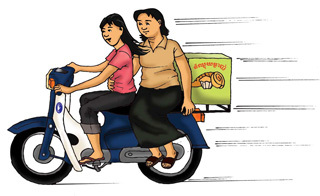 The next day, early in the morning, Samphos and her mother traveled by moto to deliver baked goods to different shops. This tiring work took all morning, but with Samphos to help it was a bit easier. Samphos’ mother also collected money for that week’s sales. "Mum, eh... next year, I’ll be in grade 12. Do you think I should have summer class to prepare myself for this important grade?" asked Samphos. "Sure, you should have it, but...", Samphos’ mother said. "We should take the rest of these cookies to the Old Market this afternoon, and collect money from the sellers. So you will have enough money for this summer class," she smiled. "Don’t worry Mother," Samphos says. "I will take them this afternoon". Her mother smiled again. "OK!" After lunch, Samphos set out on her bike to the Old Market. "I’m sorry Samphos," says one lady, "but we have to pay some extra fees this month." "The tax has gone up, Auntie?" Samphos asked curiously. "No, no... to be a seller you must take the good with the bad. There are some ’unofficial’ fees I must pay. This is just the way of life as a seller. So I won’t be able to pay you for all the cookies for this last week." Samphos continued around the market. Each person had a similar story. "I’m sorry, but the price of business is going up. Can you reduce the price of your cookies?" "Thank you for the cookies, maybe we can pay next week." "I’m, sorry, we had extra payments to make." "I’m so sorry, my costs are getting higher." After distributing all the cookies, Samphos sat down at a sugarcane juice stand and had a drink to refresh herself. Then she counted her money. There was a lot less than usual. This was very upsetting. What would she tell her mother? It could be a big problem for the family. Her class! It seemed so far away now. What would she tell her family? What would she tell her friends? Samphos felt both sad and afraid to face them. She sat at the cane juice stand a long time, thinking of what to do. Can YOU write the conclusion?